The issues of leadership in organizations are of great importance, both theoretically and practically. Indeed, the changes that are affecting the economy today are increasing competition among organizations, which means they face many challenges and threats. Leadership, therefore, becomes important to face this competition (Eikenberry, 2007). In this regard, several authors indicate that the use of an appropriate leadership style has a direct impact on the performance management of employees and organizations (Eikenberry 2007, Hunt and Davis 2009). 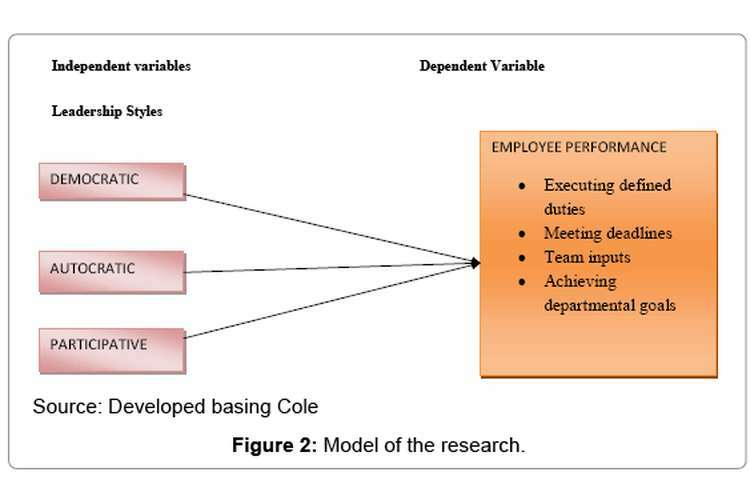 It is in this perspective that this research focuses on the influence of leadership style on the performance. The linkage between leadership and performance has a massive importance in today’s business world in both theoretical and practical firms. Many authors have quoted that leadership style has a direct impact on employees and organisation which eventually influence the business performance (Eikenberry, 2007; Hunt et Davis, 2009). In fact, the business leadership has different styles such as Autocratic, transformational, charismatic and so on, that leaders can adopt within an organisation to contribute in the business performance and this what makes the difference between organisation in both same and different sectors (Eikenberry, 2007). However, the impact of Business leadership on the business performance can be positive as well as negative, depending on how it is dealt with. Today’s businesses are looking for a beneficial leadership more than anything else because having a good business leadership makes all the difference by creating value and drive to successful business performance. A good business performance is what beauty and heath sector services expect. The United Kingdom is well known with its beauty and health sector as it is rated the third fastest growing sector. There completed deals in the UK which PWC was involved, including Holland and Barret, Body shop and Grenade, drove many investors from the UK and abroad (Lisa, 2017). France-based cosmetic giant L’Oréal, for instance, has noticed a big drop in its economics due to its poor performance especially in Great Britain and North Africa in 2008 (Katy, 2008). However, the economic climate wasn’t the only issue the cosmetic brand faced, the entry of the natural brand in the market to compete was on of factors that made it fail. Furthermore, consumers are becoming aware of healthy habits, thus there has been a change in consumer’s behaviour that leaders must be aware of to build trust and consumer satisfaction. Health and beauty (H&BA) for instance is a non-profit association founded in 1969, to gather senior sales and marketing executives in the UK to discuss the changes and to adopt the suitable leadership to meet the consumers and costumer’s changes. The evolution of leadership style in the industry is made through health and beauty networking events, meetings and seminars to reinforce the communication between retailers, wholesalers and suppliers in the sector. Health and Beauty sector is expecting a growth of 2.8% over the next three years, it is wide and can be divided into many small segment, such as make up, skin care, hair and body treatment, etc... Despite the continuous growth that those segments have known and promises to keep it up in the next coming years, the sector faces many challenges that have to be surmounted including sustainability and environmental challenges. Nowadays, people became conscious of the products they use and the ingredients it contains, the environment and its product performance are one of the consumers concerns that business leaders must take it into consideration. On the other hand, social media impact is also massive, as the number of influencers on YouTube channels and Instagram is increasing and consumer get access to more information comparing to before. The demand of green and natural products is increasing, consumers avoid any product that contains chemicals and modified ingredient that can harm the skin and environment. Leadership plays a massive role in the company success and competitiveness especially in the organisation’s performance, however the majority of the studies were critically about the impact of the leader on the follower (Bass 1990) or leadership issues. The gap in leadership effectiveness on organisational performance is remaining and hasn’t been focused on yet. Life is full of challenges in all the fields, business, education, healthcare, and so many others. Leadership is the key to find opportunities to overcome those challenges. However, leadership differs from leader to another depending on the style they adopt as well as the situation they are dealing with, but they practically share all the same purpose which occurs in planning and achieving a visionary goal. The quality of a leader is significant because it has a massive impact on the business effectiveness. Leadership is very important when it comes to organisations success, thus deficiencies in leadership affect organisation in terms of work efficiency. The purpose of having an organisation is to create goals that has to be achieved by subordinates who eventually has to be guided and controlled. After some studies, Samikcha S published (2014) in her article that employees use 60% of their capabilities in the work without having someone to push them, while the other 40% depends on the leader’s motivation and influence to get the work done. This study confirms that leadership is the key to success in any organisation. Leadership is very important in today’s businesses for so many reasons. First of all, the influence that a manager has on the subordinates including inspiration, motivation and communication. Second, a leader supports his followers by providing them trainings and development in order to be efficient to the orgaisation, eventually in their future life and fulfil their needs and concerns as well as solving problems with a strong communication and enthusiasm between each other. Last but not least, leaders cope with environmental changes which became a vital factor in today’s organisations. The study of the relation between leadership and performance and evaluating the impact of leadership on health and beauty performance is crucial. First, it will link between the leadership roles and the performance of the business in all levels. Second, it will discuss a topic that became very important and popular in today’s life and fill the gap of other researches. It will also clarify and distinguish a responsible leader from a non- responsible while facing challenges by stating the success and failure of leadership in health and beauty in the UK. On the top, the study will give a clear idea on the current threats and challenges the beauty and health sector facing. Statement of the problem: Despite of its growth and position as a leading industry, the beauty sector is facing a lot of challenges according to John Chave, the director general of cosmetics in Europe, 2016 that beauty industry was facing many issues and the market failed by 2.1%. The sector has a lack in the risk-based approach in the assessment of ingredients and products (Premium- beautynew.com, 2016), on the other hand, the product preservation is also, a challenge the sector is facing as there was a lack in new preservatives allowed in the market, the evolution of influencer is one of the issues as well as increased competition especially from start-ups who were capable to fill the niche gap in the market whereas large brands couldn’t take the risk (weareready.com, 2018) there aren’t the only issues the market had or is currently having, but the managerial problem is how can leaders deal with those challenges to prevent market drop and to ensure a better performance.